29/1/13 - Acquisitions - Madrid, Museo del Prado - The donation to the Prado of twelve Spanish art works ranging from the 13th to the 15th century by the collector José Luis Varez Fisa, born in Barcelona in 1928, is the largest made to this museum in over fifty years. A special room will be set aside to welcome this ensemble which will bear the name of this generous patron. The four oldest works, two painted panels, a sculpted altarpiece and a large fresco fragment, date from the 13th century. 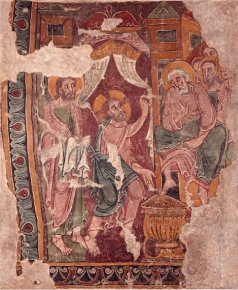 The fresco, representing The Washing of the Feet (ill. 1) is attributed to the Master of San Esteve de Andorra and will now enable the Prado to display an aspect of Catalan Romanesque art previously lacking in the collection. The name of this artist comes from the mural paintings in the church of San Esteve in Andorra, partly preserved and on view today at the Museu Nacional d’Art Catalunya in Barcelona. The two painted panels (ill. 2 and 3) were part of the antependium or facing on the altar. 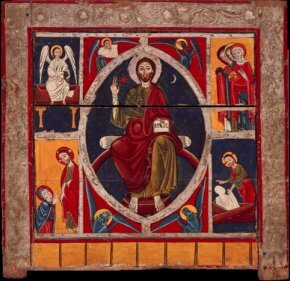 One, representing Christ inside a mandorla, surrounded with the symbols of the Evangelists and four religious scenes, is by the Master of Lluça and is also from Catalonia, more precisely from Ripoli in the province of Gerona. The second one, by an anonymous Castilian master, from the Rioja, shows scenes of Christ as a child. While these three works are still Romanesque, the altarpiece in sculpted wood from the late 13th century, is in Gothic style and still a bit naive (ill. 4), depicting scenes from the life of Saint John the Baptist. Moving forward in time, the next work is a large ceiling (11.5 m by 6.3 m), painted circa 1350 with geometrical motifs and scenes with figures, from León (ill. 5). It will be installed in the room designated for the donation. 4. León, last fourth of the 13th c.
Dating precisely from 1359, thus contemporaneous to the ceiling, a Virgin Nursing the Child, known as Virgin of Tobed (ill. 6), is by the Catalan painter Jaume Serra. The Prado’s acquisition is particularly important as the museum can now totally recreate the altarpiece from the church of Our Lady of Tobed in Zaragoza. The Virgin is in fact the central piece of the triptych with the two side panels representing The Story of Mary Magdalene and The Story of Saint John the Baptist, which have belonged to the museum since 1965. The Prado has not said if the work will be reinstalled in the donation room, we of course hope this is the case, even if these two panels are not part of the ensemble. First half of the 15th c.
The first half of the 15th century is represented with a magnificent polyptych (ill. 7), in excellent condition for a work of this kind and almost complete, painted by the Master of Torralba, an artist active in Aragon identified as the one who produced two altarpieces in the church of San Félix de Gerona located in the city of Torralba de Ribota. 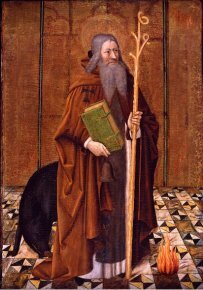 A bit later in date, a Saint Anthony Abbot (ill. 8) is by Joan Reixach, a painter from Valencia. 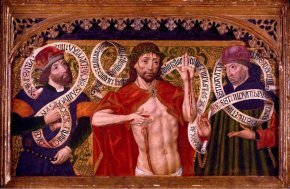 The evolution towards the Renaissance already discernible in Reixach’s painting is fully expressed in the two superb panels from the same altarpiece painted by Pedro Berruguete (ill. 9 and 10) which join an already rich collection of works by this artist. We close our brief news item of this very important donation with another painting which can be dated to around 1500, by a Flemish artist working in Castile, Diego de la Cruz, showing the Christ of Pity surrounded by David and Jeremiah (ill. 11), and an alabaster piece still showing remains of polychrome work executed by Gil de Siloé (ill. 12), one of the most important Castilian sculptors active in the last years of the 15th century. This sculpture, in a fully Gothic style, is very close to another Virgin with Child by the same artist residing at the Cartuja de Miraflores in Burgos.